Introducing Mega-Nutrition Organic Superfood From Quantum Wellness Botanical Institute... Your "Fountain Of Youth" In A Jar! 1) Unparalleled Nutrition - It's the only superfood blend that contains the perfectly measured serving of all 8 stellar superfoods in their raw and certified organic form, which ensures extraordinary health benefits. 2) Inexpensive – A considerable savings over buying each individual ingredient in bulk form and measuring and mixing yourself. 3) Convenient - The recipe is already pre-mixed into a powder blend, ensuring you'll get the optimum and most nutritious amount in each serving —it's so easy, all you have to do is scoop and mix the delicious tasting powder into a glass of water or juice... you can even add it to your morning smoothie. 4) Pleasant Taste - Mega-Nutrition Organic Superfood has a mild, pleasant taste. Rejuvenate... Revitalize... Regenerate... 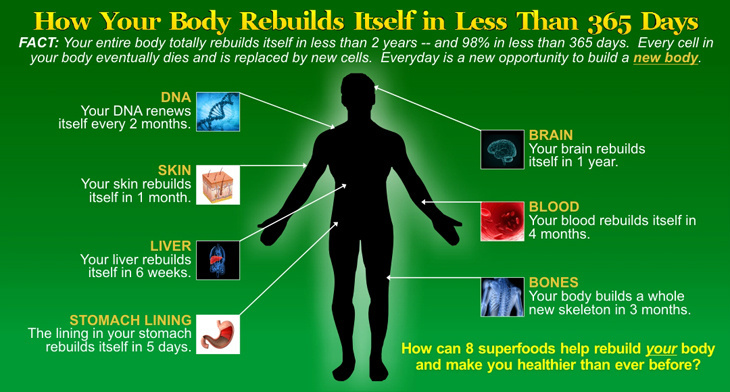 Renew... And Rebuild Your Body—And Dramatically Improve Your Health And Longevity With Mega-Nutrition Organic Superfood! Superfood #1: Chlorella - The World's Greatest Healthy Aging Food! Chlorella is a single-celled, water-grown algae that contains more health-enhancing chlorophyll per gram than any other plant. It is extremely rich in vitamins, minerals, amino acids, essential fatty acids and many other nutrients that are beneficial to your health. Moringa leaves are a healthy aging powerhouse because they contain several thousand times more of the powerful nutrient zeatin than any other known plant. A study published in Rejuvenation Research shows the undeniable youth-preserving effects of zeatin are due to its ability to regulate cell division and growth, and delay cell aging. With the zeatin contained in moringa, new skin cells grow at a faster rate than old skin cells die. This results in a marked reduction of look and feel of wrinkles on the face and other parts of the body, and a more youthful skin appearance. Superfood #3: Maca - The Sacred Plant More Precious Than Gold! Maca (Lepidium meyenii) is a hearty root vegetable that grows in the high Andean plateaus of Peru. It is full of essential nutrients drawn from the mineral rich soil of the high Andes and the ancient Inca worshipped it as a sacred plant. Maca has gained the reputation of being a super herb in recent years, but it has actually been traditionally used for over 2,000 years to address a variety of health conditions. Dense Food on the Planet! Spirulina is a blue green algae, considered to be the most nutrient dense food on the planet. and immunodeficiency diseases (immune concerns). Cacao comes from raw cacao seeds, the product of a fruit grown on the cacao tree (theobroma cacao), which grow naturally in the shade of tropical rainforests in South America and the West Indies. Cacao is the No. 1 source of magnesium of any food. Magnesium balances brain chemistry... builds strong bones... helps regulate heartbeat and blood pressure... helps prevent constipation and even eases minor menstrual cramps. Cacao has more antioxidant flavonoids than any food tested so far—more than blueberries, red wine, and black and green teas. Serotonin - Cacao raises the level of serotonin in the brain; thus acts to regulate mood, help with PMS discomfort, and promote a sense of well-being. Endorphins - Cacao stimulates the secretion of endorphins, producing a pleasurable sensation similar to the "runner's high" a jogger feels after running several miles. Sulfur - Cacao is high in the beauty mineral sulfur. Sulfur builds strong nails and hair, promotes beautiful skin, detoxifies the liver, and supports healthy pancreas functioning. wheatgrass juice promotes a healthy aging process because it cleanses the blood, thereby helping to rejuvenate aging cells and helping to tighten loose and sagging skin. The high chlorophyll content of wheatgrass, as well as the amino acids, minerals, vitamins and enzymes it contains enable wheatgrass to provide a wide range of health benefits. Regulates normal cell growth: Studies show that wheatgrass juice has a powerful ability to regulate cell growth. Powerful detoxifier: Wheatgrass protects the liver and the blood, and neutralizes toxic substances like cadmium, nicotine, strontium, mercury, and polyvinyl chloride. Blood builder: The chlorophyll in wheatgrass is almost identical in chemical composition to hemoglobin, the compound that carries oxygen in the blood. 600 Times More Vitamin C Than Oranges! Rich Superfood in the World! The acai berry (Euterpe Oleracea), the fruit of the Acai Palm tree which grows in the flood plains of the Amazon in Brazil, is a small, black-purple berry that is considered by many to be one of the world's most nutritious foods. That's because it's the most antioxidant-rich superfood in the world, with a phenomenally high ORAC (Oxygen Radical Absorbance Capacity) value. These berries contain a high concentration of beneficial anthocyanins—up to 30 times more anthocyanins than red wine! Anthocyanins are a group of polyphenols high in antioxidant value, and this gives them the ability to support healthy aging. And how many more quality healthy years you'd add to your life if you rebuilt your body—just like Mister B—with these natural, raw, organic mega-8 superfoods!